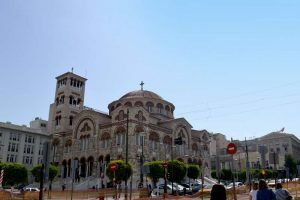 Athens, Greece – Mediterranean Cruise Destination – Next Stop, Port of Piraeus. 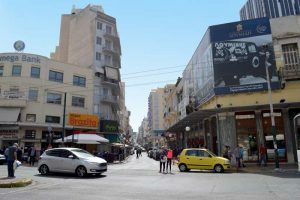 Piraeus, Greece is the often overlooked port city in the urban area of Athens. Of course, if you have not been to Athens, GO! Otherwise, why not while a day away in wonderful Piraeus. (photos) We have learned to love this little city by the sea and take every opportunity to spend some time here, often overnighting. 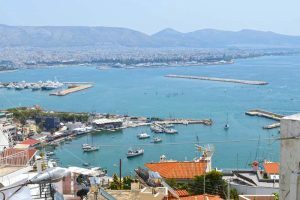 Here is how we spent our most recent cruise stop in Piraeus – cruise port of Athens. Our ship, Celebrity Constellation docked at 6am and was cleared by 7am. While we were still tucked snuggly in our beds, the majority of guests were frantically wolfing down their breakfasts, sneaking food from the buffet and not so discreetly stashing it into their free cruise ship totes and fighting to be the first off the ship, onto a tour bus, out to a taxi – whatever their choice of the day. Making the mad 12 kilomter trek to Athens. At 8:30am, we casually crawled out of bed, showered and went to a very empty and relaxed breakfast. We sat on the open air deck enjoying our fresh squeezed orange juice, eggs benedict and fruit plate, without the regular morning hum of scraping chairs, clanking plates, and chatter. After breakfast, we went back to our cabin, grabbed our backpacks and were off without fighting any crowds. We casually walked the 30 minutes along the port into the sleepy city of Piraeus. It was slowly starting to roll up the shutters, people greeting each other, coffee brewing, lots of smiles! Did I mention how much I love Greece?! 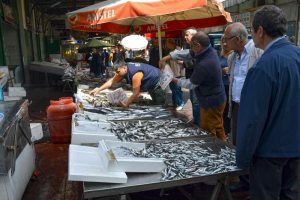 It was a Saturday, so of course the first thing we did was hit the local market. 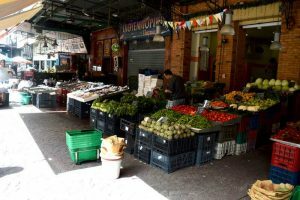 Although it is very small compared to other markets, it had everything you would expect; vegetables, fruit, fish, meat. Locals greeting each other, kissing, hugging, laughing, probably exchanging the latest gossip and of course, shopping. After the market, we strolled the streets enjoying the weekend bliss. 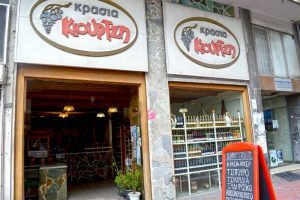 No surprise if you follow me, we stopped at a shop selling wine – well, specifically Greek Wine. The owner was an eccentric, wonderfully crazy joy. He showed us around, explaining the wines (unfortunately no tasting here) and other small treasures he sells. We bought 2 bottles of the homemade brew and were on our way. 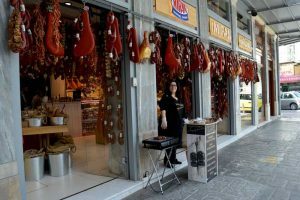 Next stop was a sausage store; fresh smoked, dry cured, loukaniko – you name it, they had it. A lovely lady out front offered tasty samples, although she did not speak english, we had a lot of fun. Of course, we bought some delicious sausage to take home to my father in law. 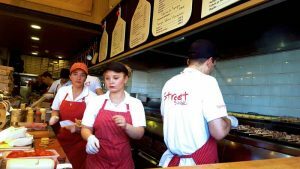 The sausage sampling woke our taste buds, leading us to our next stop – Street Souvlaki (I have no financial gain or affiliation – simply love this place!). 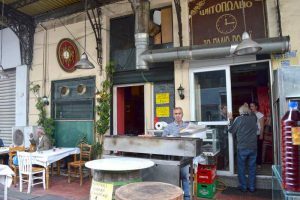 They have 2 fast food style restaurants in Piraeus and we visit it at least once every time we are in town. One wall is a barbecue where they are busy grilling meats of all kinds and vegetables – the smell of bbq wafts out the door enticing you in. The prices are very good and the food is amazing. Menus are available in english and the staff is exceptionally friendly. Think pitas, souvlaki, feta cheese, kebab, and my favorite addition to everything, Tzatziki! 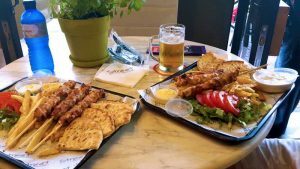 This time we ate souvlaki kebabs, kebab pitas and a side of tzaziki for a total of €10.50 with beer and a water. After lunch, we negotiated a taxi to hit a few spots we still had not visited. Our driver was very friendly, chatty and accommodating. 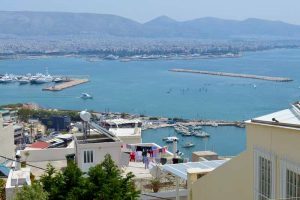 We drove up the windy, steep back streets of Piraeus and eventually found ourselves high on the hill of Kastela with fantastic views of the Saronic Gulf and Athens. We also had a nice view of the Peace and Friendship Stadium. 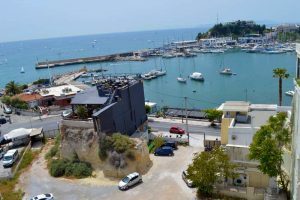 After spending some time walking around and enjoying the magnificent views, we slowly wound our way down to the yacht marina of Mikromilano for a closer look. Restaurants and cafes line the very busy, picturesque waterfront. From there we headed over to the equally busy Bay of Zea. Next time we will come directly to this area and enjoy the small port atmosphere! Our taxi took us back to the ship where we paid him the pre agreed price of €18 (we gave him €20). The price was expensive, but we really wanted to check those areas off our list. Next time we will investigate taking the local bus. 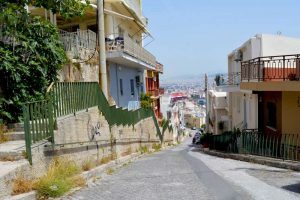 Can I walk to Piraeus? Yes, if you do not have any mobility issues. The walkways are are uneven. How long does it take? It should take around 30 minutes – not rushing. Do they speak english? Yes, many locals speak very good english. When they do not speak english, they are still very friendly and try hard to understand. So speak up and meet some very wonderful Greeks! Is there a shopping district? Yes, here is the map. Short walk of 34 minutes if you go direct. Are there pharmacies? Yes, lots. The prices are incredibly good, so if you need anything, this is the place to get it. Pharmacists are knowledgeable and speak english. I want to go to Athens. Can I take the public bus? Yes! I found out that the X80 bus goes from the Port to the Acropolis in 30 minutes for EUR 4; it runs every 30 minutes and has some interesting stops. For more info, click here. 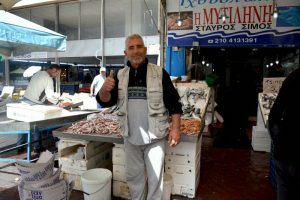 A few of our photos taken while we were docked in Piraeus, Greece. 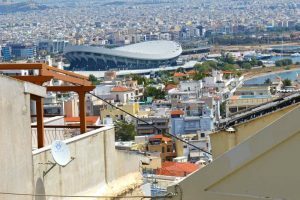 Rather than going to Athens, which we had already seen, we opted to spend some more time in Piraeus, a place that is starting to feel like home! 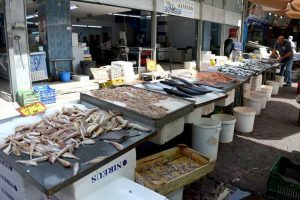 To read how, where and costs, check out my blog: Piraeus – Cruise Ship Port of Call Athens . 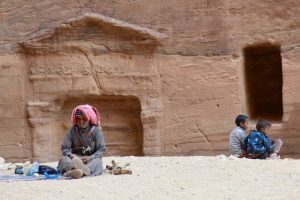 How to visit Petra by Cruise Ship, how much will it cost, currency and how much time do you need? 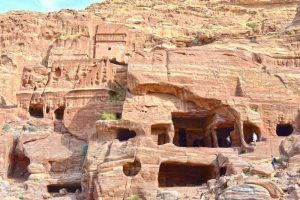 Travel Guide to The Rose City of Jordan, Architectural Mystery, Traveler’s Delight. We arrived by cruise ship and have much info to share. If you arrive by cruise ship in Jordan, do not miss this world wonder under any circumstances. (Click to Visit our Photo Album) Come prepared (see Q & A below) and conquer this amazing UNESCO site, even if only for a short period. 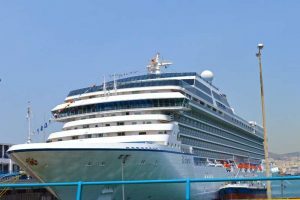 Our ship, the Celebrity Constellation, docked at Port Aqaba and we were allowed to disembark by 10 am (time varies from ship to ship, but circumstances remain the same). 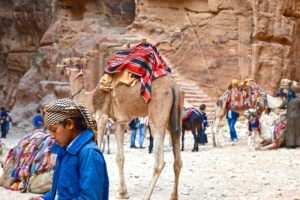 Rather than taking the very pricey 10 hour USD$280 ship excursion, we hopped on the 15 minute free shuttle bus to town, where for the next 15 minutes we negotiated a taxi to Petra, also know as the Rose City. 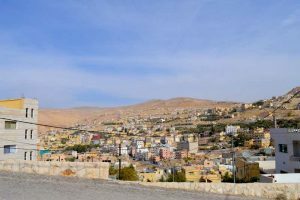 After discussing with several drivers and comparing prices in a friendly, respectful manner, we settled on USD$120 both ways with our driver waiting 4 hours – we gave him a USD$10 tip on top of the payment as a thank you for a total transport cost of 93 Jordanian Dinar. The negotiation time was well worth it! I would recommend not paying more than 120 Jordanian Dinar (USD$170) for a round trip, including tip. There are 2 atms on the right hand side on the way to Petra where, if you ask him to, the taxi will stop for you to pick up Dinar. Alternatively, there is an ATM in the Petra entrance. The Petra entrance fee was 50 dinar. 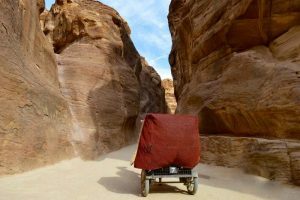 Once in, you have the option of taking a horse and carriage through the passage (Siq) to the Treasury for approximately $20. This we found a little confusing, as the back of the ticket implies it is included??? We walked; it took about 30 well spent minutes with lots to see and plenty photo opportunities. 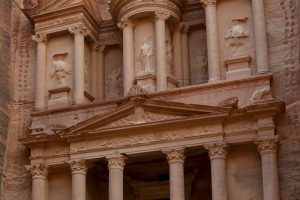 The Treasury, carved from the glorious pink sandstone is where is opens up to the ancient archaeological city of Petra showcasing temples, tombs, theatres and more! No matter what, if you have the opportunity of docking in Jordan, do not miss visiting this world wonder! I am fairly certain, you will not look back and say: I wish I had not visited Petra, or Petra was a waste of time. What currency can I use? Dinar – There are 2 atms on the right hand side on the way to Petra where, if you ask him to, the taxi will stop for you to pick up Dinar. Alternatively, there is an ATM in the Petra entrance. Our total cost for 2 persons: USD$270 – The ship excursion would have cost us USD$560, so we saved USD$290!!! How much time total will I need for the complete Petra excursion? Approximate Time needed for the self excursion: 3 hours travel time, 4 hours Petra (3 if you are good on your feet), 15 minutes for the shuttle + 45 minutes buffer time (waiting for shuttle bus, negotiating prices, etc.) for a Total Time of 8 to 10 hours – less if there are no wait times and you are able to negotiate a taxi quickly. Note: Times and costs are based on our experience. 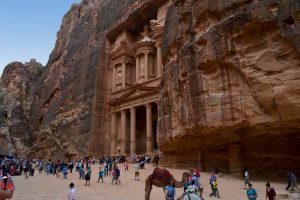 Please feel free to visit my blog entitled Petra by Cruise Ship, the Rose City of Jordan to learn how much will it cost, currency and how much time do you need. The article finishes with a great Q & A and your input is welcomed and encouraged. For now, enjoy the photos!